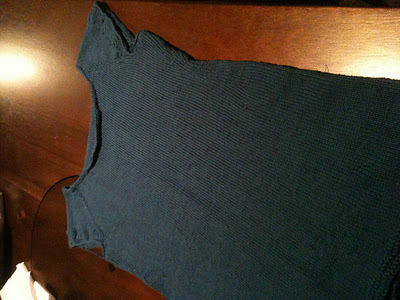 Knit 2 Together: Finished Object Report!! As most of you already know I've been working on the Spring Garden Tee - Adult Version for quite some time. Over the Thanksgiving holiday my sweet MIL helped me finish it once and for all so I could finally get it blocked!! It looks great and I'm really excited to wear it! The lace detailing on the sleeve looks great, although I confess I probably messed up a few stitches here and there...I'm still very pleased with the finished product!! I was going to give up on it because as I bound off it became WAY to tight and wouldn't lay flat against my jeans...but my MIL wouldn't give up and worked tirelessly to get it right...so now I have a brand new sweater. Thank You, Thank You! I Love It!! 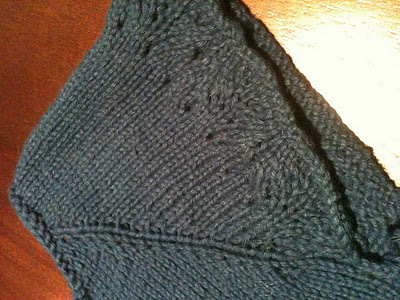 Now I think I will work on my next project, Nantucket Red designed by Thea Colman. I love the design, it's so feminine and looks so comfortable. I've decided to use Sublime Tussah Silk DK in a gorgeous Grey that I already had in my stash...I'm trying desperately not to buy any new yarn...too bad I squashed that on Black Friday. In my defense there were ALOT of people there buying too!! ﻿ I think it will knit up beautifully, wish me luck! Happy Knitting!!! How wonderful that you have a MIL who won't let you give up on a knitting project. Your tee looks great and as for the Nantucket Red, it's a great little cardi.